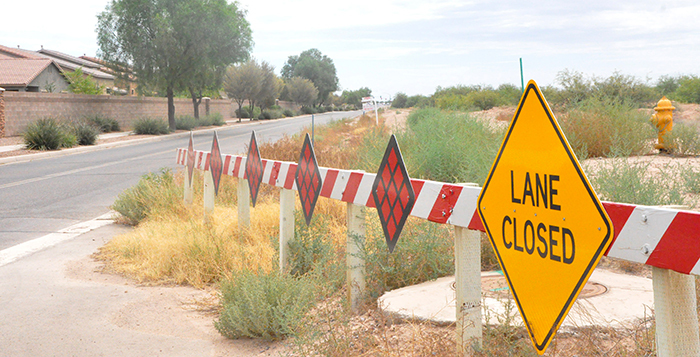 Home Tags Articles tagged with "Global Water"
The Maricopa City Council approved the extension of a 16-inch water main down State Route 238 west of Maricopa Tuesday evening at their regularly scheduled meeting. In a three-way agreement, a 16-inch water main will be extended one mile from its present location at Smith-Enke Road and SR 347 by Global Water Resources then the City of Maricopa will extend the line another three miles west along SR 238 with the goal of servicing the new Apex Motor Club location. The cost of the line is estimated to be about $750,000 per mile, possibly more. The city’s share of the extension is $1.5 million, and Apex will kick in $1 million. The city eventually is expected to recoup its $1.5 million from Global Water as developers build in the area and pay to tap into the new water main. Global will also pay for the upsizing of the water main along the city’s three-mile extension area from 12-inch to 16-inch pipe. At the city council meeting, a citizen asked members of the council what the city will gain from spending $1.5 million for the extension. City Manager Rick Horst said the Maricopa city limits already extend west of the city into the area where the water line will be constructed. He said other municipal utilities also are available in the area. Ron Fleming, CEO of Global, said Monday that extending the 16-inch trunk line one mile west will improve water pressures and services to residents and businesses already in the area. The line extension will connect in the Estrella Gin area, near the location of the new fire department. The city also has the Estrella Gin business park, that is a 50+ acre, city-owned parcel located just west of the intersection of Edison Road and Roosevelt Avenue. Tuesday evening the Maricopa City Council will examine the extension of a 16-inch water main down State Route 238 west of Maricopa. In a three-way agreement, the water main will be extended one mile from its present location at Smith-Enke Road and SR 347 by Global Water Resources. Then the City of Maricopa will extend the line another three miles west along SR 238 with the goal of serving the new Apex Motor Club location. The cost of the line is estimated to be about $750,000 per mile, possibly more. Global will also pay for the upsizing of the water main along the city’s three-mile extension from 12-inch to 16-inch pipe. While the intention of the line is not just to serve Apex but the entire growing region, Apex will kick in $1 million toward the new water line. “Global Water’s involvement is we have a water line improvement that we can make out in that vicinity,” said Ron Fleming, CEO of Global. Fleming said extending their 16-inch trunk line will improve water pressures and services to residents and businesses already in the area. The line extension will connect in the Estrella Gin area, near the location of the new fire department. The City also has the Estrella Gin business park, that is a 50-plus-acre, city-owned parcel just west of the intersection of Edison Road and Roosevelt Avenue. Global Water has invested about $40 million in Maricopa’s water system over the past three or four years, according to Fleming. “We’re happy to do it. All projects that are necessary to provide Global service for our customers and keep up with the growth that Maricopa is experiencing. Apex is just the next great community project,” Fleming said. 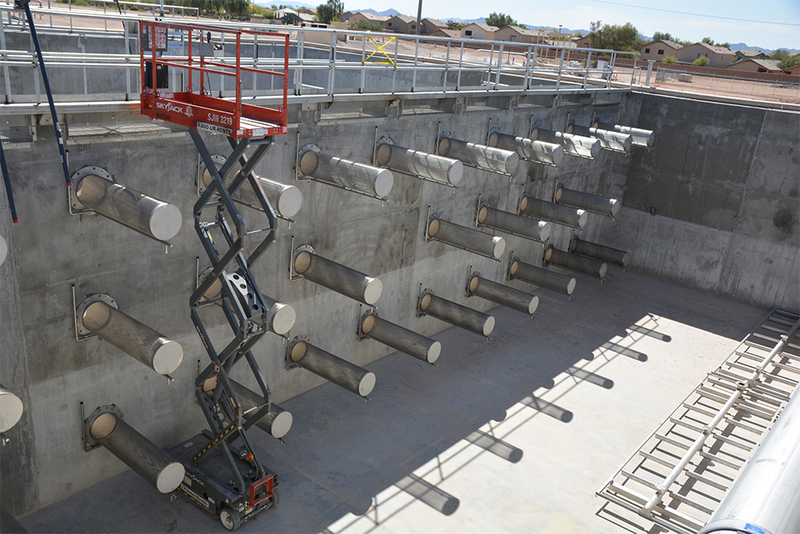 One important factor in Maricopa’s growth is Global’s assured water supply, which is necessary before construction can even be considered, if the project needs water service. “We are happy to work with Apex and the city to ultimately develop a utility solution that works and let that project move forward. This water line is a component of that,” Fleming said. The water line agreement is on the consent agenda for Tuesday’s city council meeting, which begins at 7 p.m. at City Hall. Watch for InMaricopa’s series on the Drought Contingency Plan and Maricopa sustainability starting March 1. He said it is time to find the right balance in Pinal County to work together and address the water issues of the day. The Colorado River provides water to approximately 40 million people in seven states and in Mexico. The water is provided to about 4 million acres of farm land. He said most people saw this trend coming many years ago and began planning for this event. “That’s where the talks began that turned into the common name of DCP, Drought Contingency Planning,” he said. Fleming explained how different tiers of water levels will affect the amount of water that is cut back to Arizona. Beginning in 2020, the DCP engages when Lake Mead hits a level below 1,090 Mean Sea Level (MSL). At that point, called Tier 0, 192,000 acre feet that was going to Arizona is cut back. Tier 1 engages at 1,075 MSL and an additional 320,000 acre feet is cut. The Colorado River is currently at 1,085 MSL. If the water continues to fall in Lake Mead, virtually all water to entities besides Native American reservations would be stopped from flowing out of the Colorado. Even the reservations could lose some water flows in the event the levels dive too low. He said DCP is intended to bring about larger cutbacks on a shorter timetable. “So that we can protect Lake Mead and keep that reservoir from hitting those shortage declaration levels,” Fleming told the MEDA members. He said the Tier 0 level on Lake Mead is already in effect. Fleming said the Bureau of Reclamation believes there is a better than 50 percent chance that Lake Mead will hit the Tier 1 trigger as early as 2020. “When we hit the Tier 1 reduction, it fully eliminates the agricultural pull that primarily comes into Pinal County,” Fleming said. He said in addition to ag losing all its water, Tier 1 cuts will also start to eliminate some of the NIA (Non-Indian Agricultural) Priority Water. 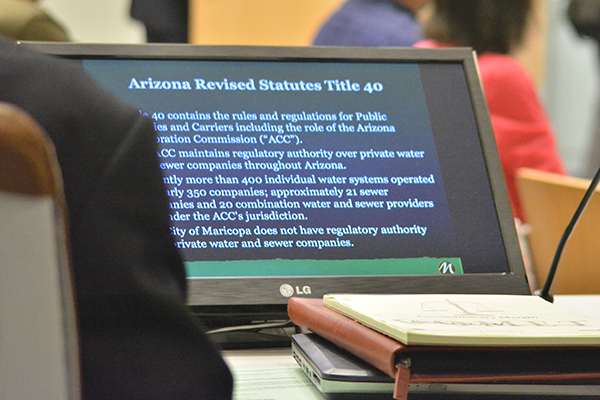 Fleming explained that Arizona has junior rights to allocations of Colorado River water. It will quickly become unlikely that any Colorado River water will be used for agriculture outside of the reservations. “There is some mitigation being done in DCP for three years. They found a way to continue to supply around 100,000 acre feet per year, or about a quarter to a third of what they’re used to for the next three years,” Fleming said. “However, in 2023 to 2025 the mitigation changes. In the NIA pool will go from about 50 to 100 percent mitigation, depending on lake levels. That’s when you start seeing our cities’ NIA water get cut back more. Instead of giving the ag industry surface water from the Colorado, the state, CAP and the federal government will create funding to help irrigators redevelop ground water pumping systems, according to Fleming. He said they will be rebuilding existing wells, drilling new wells and working on canals. “That will result in about 70,000 acre feet per year of more groundwater pumping in the area to make up for the loss in the CAP supply,” said Fleming. Fleming said there will not likely be new groundwater entitlements issued anytime “in the near future.” This will curb development outside of established service areas, like the area served by Global Water Resources. Global Water has an assured 100-year water supply in their service area that allows them to pump much more water that what their system is currently using. This means growth can continue in Maricopa and the area served by Global Water. 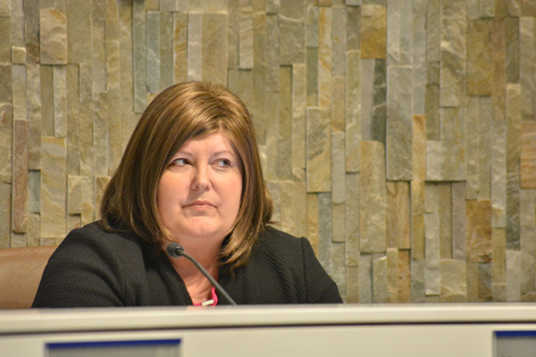 “We think what will happen, ultimately, is the assured water supply holders will get some form of a haircut to make sure that our groundwater aquifer is not going to be over-mined and the assured water supply program can be put back into effect in some way. But that is to be determined,” Fleming said. Global Water Resources CEO Ron Fleming said the lack and expense of water will someday seriously limit growth in Arizona. He said the water issue is already hindering growth in some parts of Pinal County. In speaking before the Maricopa City Council on Tuesday during a work session, Fleming said he doesn’t see the water situation as a crisis because outside water can be purchased if local reserves aren’t enough. He did admit that buying water will be expensive. Global Water is the main water utility in Maricopa. He said smart meters and reuse of recycle water is vital to Pinal County’s future. He said the good news is that the City of Maricopa has wells, and growth can occur. However, in other parts of the county the lack of quality water is already impacting growth opportunities, but he didn’t say what areas are impacted. Arizona has launched a Drought Contingency Proposal (DCP) program with the federal government. Fleming said the DCP will likely result in more underground pumping in Pinal County as less water will be taken out of the Colorado River. He said Global Water is using the state’s water model as a guide, but the company wants to use it in different ways to possibly find better solutions. “People are surprised to learn that there isn’t a regional water plan. It is up to the independent city,” he said, adding the state does regulate water but they don’t necessarily solve issues that arise. He said it makes sense that cities in this area work together to make a more regional resource plan. Jake Lenderking, Global Water’s director of water resources, told the city council water resources are adequate currently in Maricopa. He went through a PowerPoint presentation showing water demand and expectations for the future. He said the annual water that flows into the Colorado River system is being directly impacted by the drought that has been going on for decades. The shortages mean less water is available for everything including cities and agriculture. “What DCP is about is protecting the Colorado River and Lake Mead,” he said. Fleming said once Lake Mead hits the maximum drought line, there are “immediate mandatory restrictions” put into place on the state’s ability to take water is seriously impacted. The DCP is to help prevent Lake Mead from hitting the drought line, so deep restrictions don’t occur. 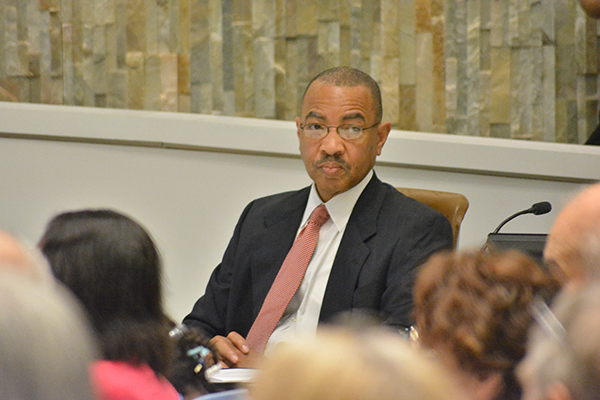 City councilman Marvin Brown has been concerned about water for decades. 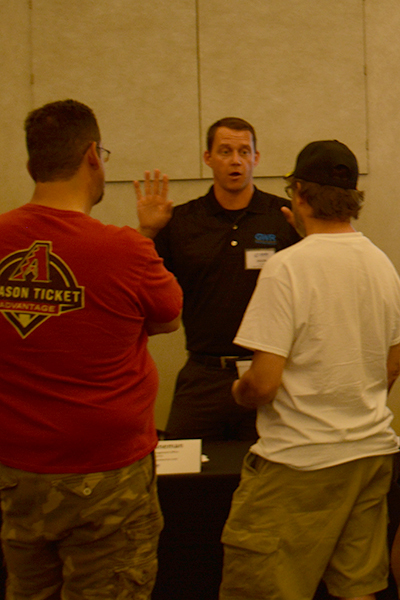 He questioned Fleming’s optimism about the future of water in Arizona. Many, including Brown, believe the state’s water resources will be in serious shape by 2026. “2026 will happen,” Brown said. “We are blessed in Pinal County with very large high quality underground aquifers. The situation that has developed is through the state’s ensured water supply program, which is based on a regulatory construct and their projections of huge demand in this area,” Fleming said, adding that 95 percent of water pumping is for agriculture. He said he believes, in the future, ag producers will likely have to give up some of their water resources. “There is a lot of opportunity to do more with the resources that we are blessed with here. 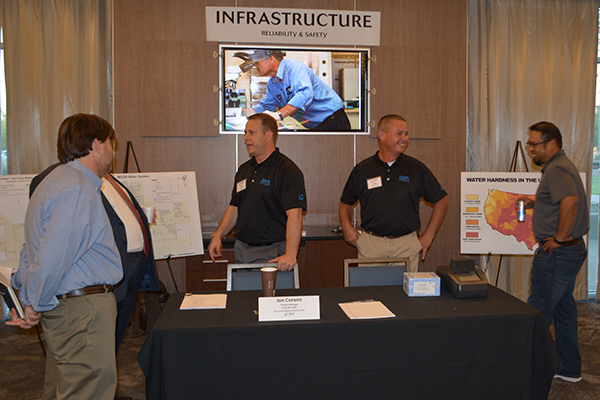 I think Pinal County can handle a significant amount of growth,” he said. Fleming told the city council Global Water’s board of directors just approved $8 million for infrastructure improvements in Maricopa. He said the funds will be used for well, distribution and pipeline improvements. He said it will make pressure and flow much better across their pipeline system, especially with the growth of Maricopa and across the farther reaches of this network. He said the expansion of the Copper Sky area will mean more water will be needed in the city as housing for 3,000 additional residents will be added. Global Water will also be fixing some of the older parts of their pipeline system. Another project on the table is Global Water’s first aquifer recharge facility. 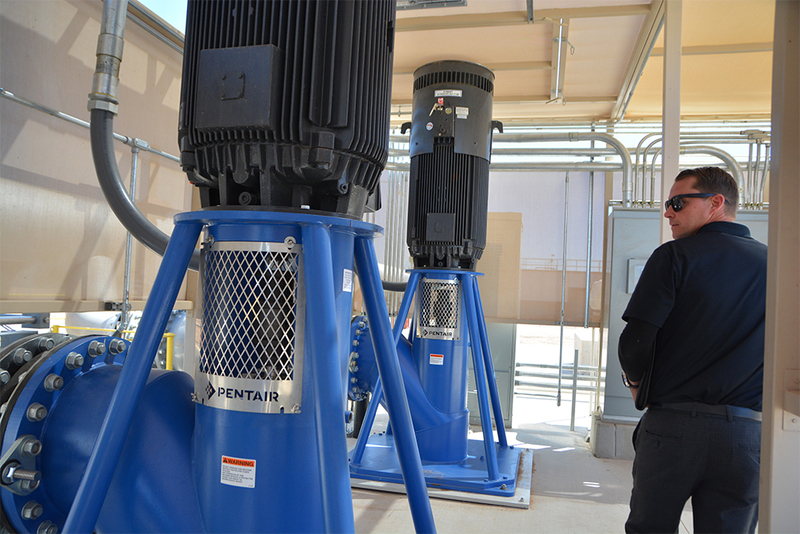 “We will be taking the excess recycled water and recharging it into the underground aquifer,” he said, adding this is the second recharge facility in Pinal County. 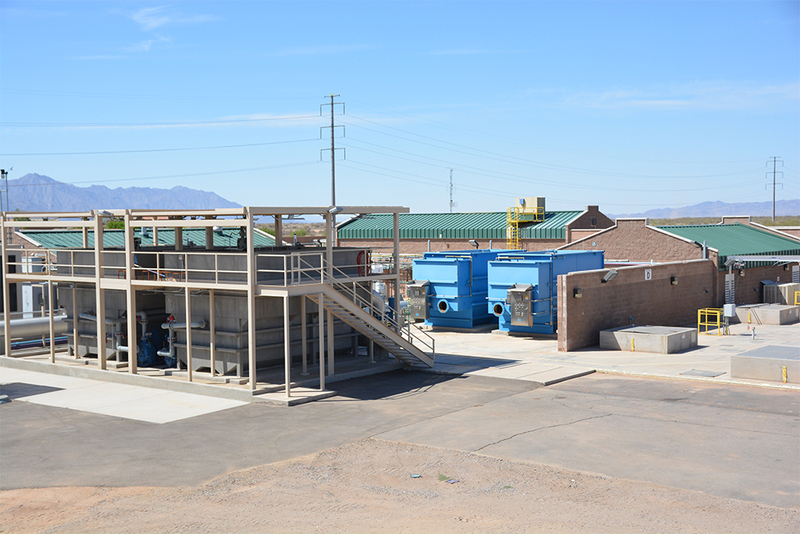 The facility will eliminate all present water discharge into the Santa Rosa Wash. Some Global Water customers were impacted Monday morning when water main broke at the intersection of Honeycutt and Porter roads. Global employees worked to shut off and re-route the water as Maricopa Police Department blocked traffic lanes. Butterfield Parkway continued to show the impact of a broken water main. Thursday, the roadway was flooded north of Butterfield Elementary School and eventually had to be closed to traffic along with Duncan Drive. Global Water customers briefly experienced brown water until crews reconfigured the supply flow. The reason for the breakage is still unknown. “The water main cracked, but there was no obvious cause of the crack when we excavated down to the pipe,” Global Water General Manager Jon Corwin said. The situation was exacerbated by a monsoon-type storm that dumped more water in the work area. Work crews temporarily had the road reopen Friday, but closed Duncan again for continued street repair Saturday. Global Water Resources showed off its not-yet-commissioned wastewater expansion project April 2, and it became an opportunity to update customers on how Maricopa’s primary water utility is trying to adapt to the city’s growth. The caveat is no water supply, especially in Arizona, is an unending resource. While Global Water says its tactics are saving money and conserving water, and a large portion of its relatively high base water rates are attributed to wastewater costs, fresh water has no guarantee in the distant future. The wastewater reclamation facility is expected to be commissioned at the beginning of May. The growth in western Maricopa, mostly along John Wayne Parkway, has put a lot of sewage pressure on the sanitary lift station at Rancho El Dorado. The company built a new, modular lift station to divert half of that wastewater to a gravity trunk line at Smith-Enke and Porter roads, from which it is conveyed to the plant. As part of its three-year, $33 million project, Global Water also invested in a new well in Rancho Mirage. The well is intended to provide additional water into the system, especially when a major line break occurs, to lessen the impact of water fluctuations. 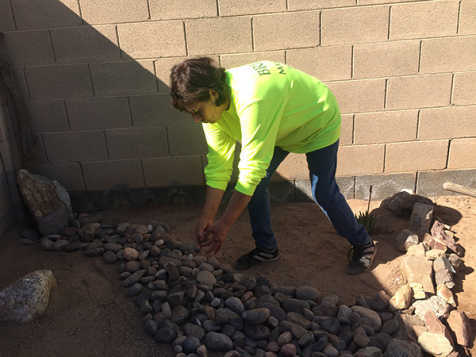 Reclamation and recycling is a large part of the process, as any Maricopa resident can attest. 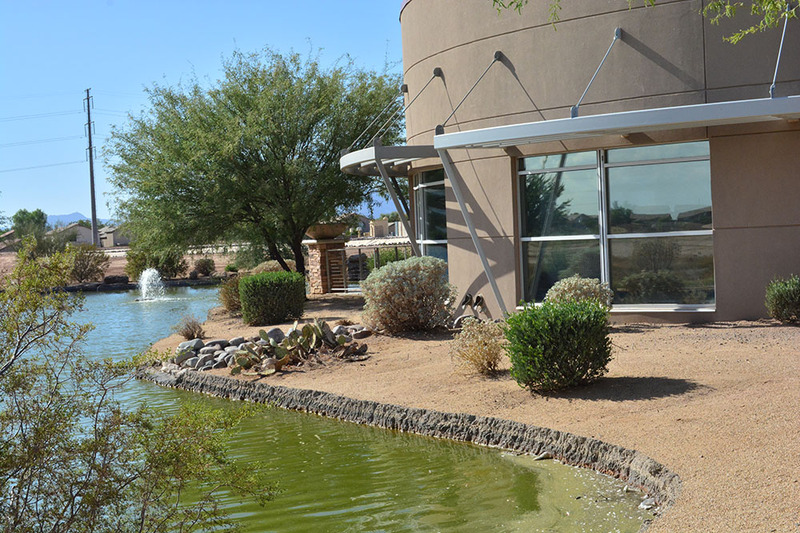 Local lakes and water features are fed with nonpotable, reclaimed water. The system filters solids from the wastewater, resulting in biosolvents that are dried and, via an ADEQ permit, are sent to a local farmer, who uses it as fertilizer. Purple pipe (reclaimed water) reduced the demand on the aquifer by about 30 percent. This story appears in May issue of InMaricopa. A company was granted a permit Nov. 9 to fill in an aesthetic opening between the first and second floors of Copper Sky Multigenerational Complex. Architekton, a subcontractor, is filling in the oculus opening that allows members in the workout room to see into the lobby. The $10,000 project is part of a larger project by CORE Construction to create room for more exercise equipment on the second floor to help Copper Sky’s revenue. HRW Builders was granted a site-improvement permit Nov. 1 for a possible Jiffy Lube. The property is at 42100 W. Maricopa Casa-Grande Hwy. 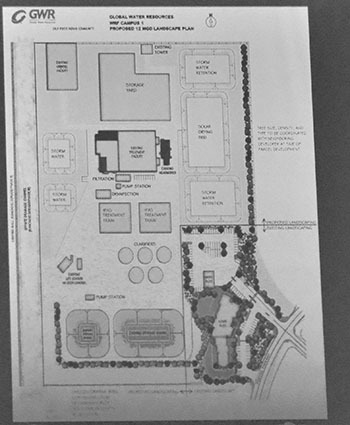 Global Water-Santa Cruz Water Company received a rezoning permit Nov. 1 for the campus on the northwest corner for The Lakes at Rancho El Dorado as part of ongoing construction for its water reclamation facility. Global also received zoning permits for 30-foot antenna poles at Rancho El Dorado, Province, Homestead, Cobblestone and Smith-Enke Road. Maricopa Renovations received a permit Oct. 18 for an illuminated black aluminum sign at 20024 N. John Wayne Parkway. On Nov. 7, Edison Pointe received a permit for two banners for the property at 20595 N. John Wayne Parkway. Nov. 2, the City of Maricopa received a temporary use permit for its 2nd Saturday Maricopa Market at Sequoia Pathway Academy. SAC Wireless was granted a permit Oct. 26 for a cell tower modification in Glennwilde. The project is valued at $9,000. The city has been looking at plans for a Circle K at Honeycutt and Porter roads. A future Circle K property received a Design Review Permit Oct. 4. Plans are for a convenience store and seven fuel pumps on the southeast corner of Honeycutt and Porter roads. Developers have been working with the city on appropriate and safe access, as previously reported at InMaricopa.com. Global Water – Santa Cruz Water Company was granted a commercial building permit Oct. 9 for a raw-water well. The site, 18303 N. Piccolo Drive, is in the Rancho Mirage subdivision on the east side of Maricopa. GWR also has a subdivision final plat amendment pending to combine two lots at the location. GWR purchased the property in May after drilling a pilot well last year to verify the aquifer. The well construction includes mechanical and electrical equipment. EPS Group, Inc. had a pre-application conference in October on the Sandbox Development in Tortosa South. Sandbox is a Phoenix-based contractor for residential and commercial properties. The property at 18152 N. Toledo Ave. is vacant land. This item appears in the November issue of InMaricopa. 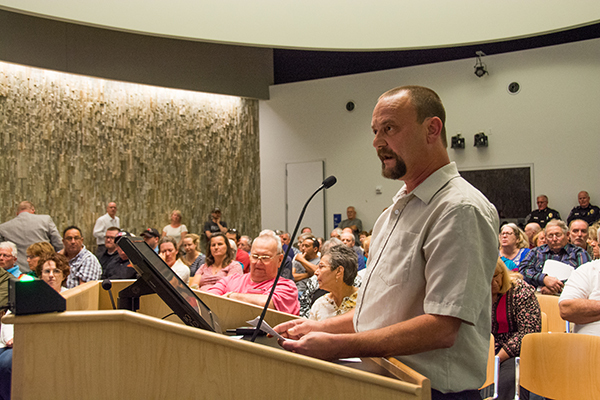 With one dissenting vote, the Maricopa Planning & Zoning Commission approved the recommendation of an expansion request for Global Water Resources’ wastewater treatment facility. Global Water had a previous expansion plan in place in 2006, but that “never panned out,” senior city planner Rodolfo Lopez said. Now the company has a new master plan that would allow the wastewater facility to treat about 60 percent more effluent. That is also when that part of the expansion is expected to come online, he said. Global Water has an industrial use permit for its expansion tanks worth $1.8 million. It will have two basins on the south end of its campus and four storm-water retention areas. 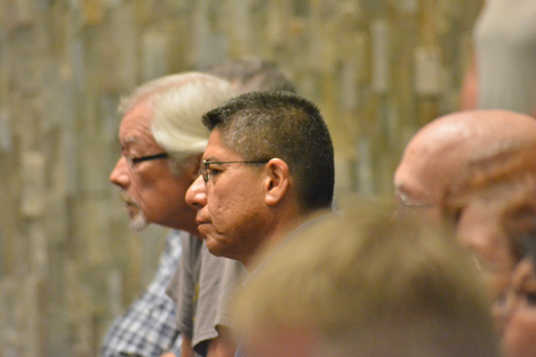 Along with the development review permit request, Monday’s meeting included a public hearing on Global Water’s request to be rezoned general industrial to meet the new code. Commissioner Michael Sharpe was not satisfied with the plans for the west border of the property, which neighbors a residential area. The Lakes property on the east side of Global Water is not yet developed, but Global Water completed a 1,200-foot perimeter wall there. That east side is also to include a landscape buffer that does not exist along the west wall. “I’m concerned about the number of residents along that wall,” Sharpe said. 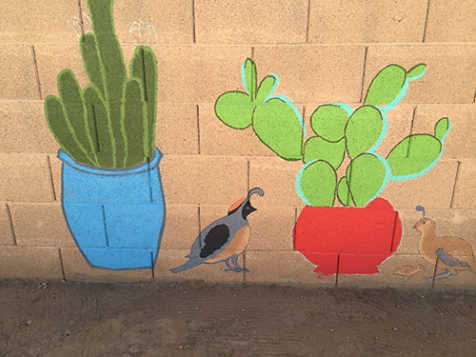 Those residents are in the easternmost neighborhood of Rancho El Dorado, which backs up to the west side of Global Water. Sharpe said they would have to see the wastewater facility with no trees or other landscaping to hide the view. Running along the Global Water side of the wall is a drainage channel rather than foliage. No landscaping is planned for that part of the property. 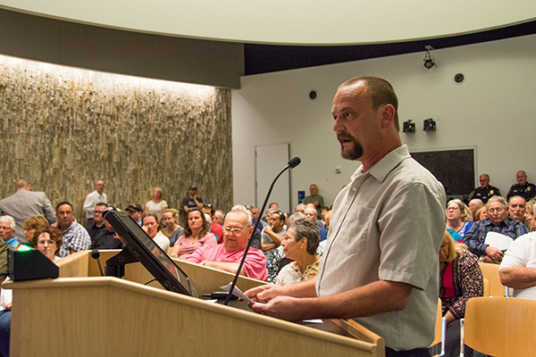 The Maricopa City Council decided Tuesday to discontinue efforts to purchase a local water utility that has been the source of recent discontent in the city. The council unanimously decided to cancel any further efforts to purchase Global Water Inc. after a third-party cost analysis came back dramatically lower than the utilities self-determined price tag. The move kills any chances of a buyout that was already very unlikely. Greg Swartz, president of public finance at the investment bank Piper Jaffray, presented the cost assessment which gave the water company a valuation of between $75-$107 million. According to the presentation, Global Water’s self-determined valuation started at $500 million. 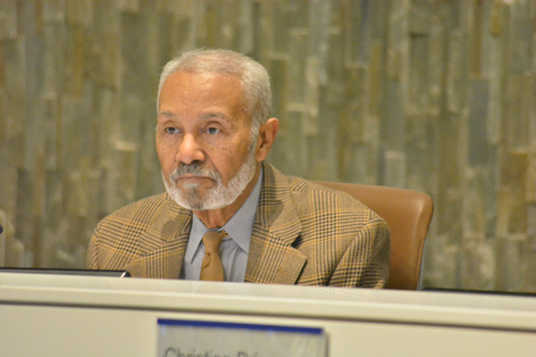 “There is not one shareholder, not one person on my board, not one person on my team that is looking to sell to the city of Maricopa,” he said. The company, Fleming said, was only willing to sit down with city officials to discuss the possibility of a buyout as a show of good faith and to display their intentions of working closely with the city. 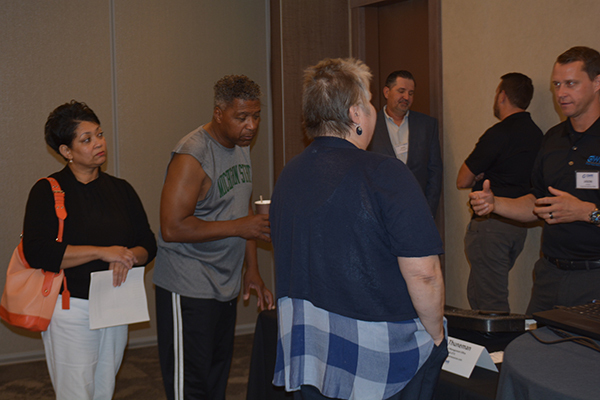 Likewise, city officials wanted to sit down with Global Water to exercise their “due diligence” as leaders and representatives of their community. “I made a promise that one of my goals during my service would be to get some answers,” Councilmember Nancy Smith said alluding to her campaign promise to improve the water utility, even if that meant a possible public buyout. 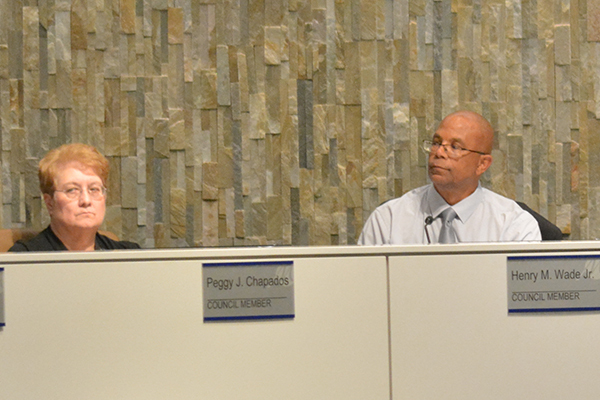 Councilmember Peg Chapados, like others on city council, said her consideration of the buyout was based on two factors – improving the water quality or lowering the rates. Even if Global Water would be willing to negotiate a price somewhere between the two figures, the City would still have had to increase the already higher-than-average rates in order to make it a viable decision. 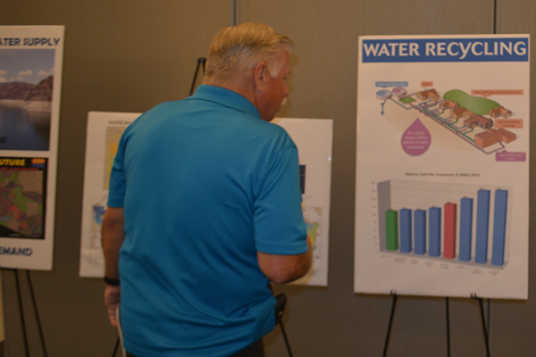 Most city officials were satisfied with the way Global Water had addressed the community’s concerns. Some even credited them with investing in the community. Others, including Smith and Chapados, expressed hope the company will continue to invest in the city’s economic development. 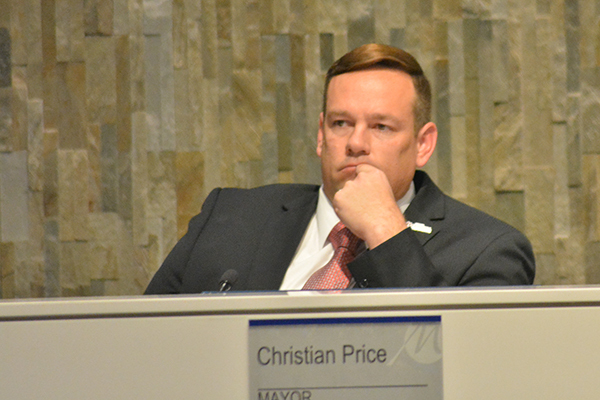 Mayor Christian Price, too, was satisfied with the result of the inquiry. He reiterated an Arizona adage he previously mentioned at a Global Water hearing, pointing out the impassioned debate surrounding such a precious resource as water in a desert town. A third Circle K is planned for Maricopa, this time on Honeycutt Road. The site is on the southeast corner of Honeycutt Road and Porter Road, 41433 W. Honeycutt Road. The store received its liquor license nearly a year ago. The current proposal is for a 5,881-square-foot convenience store with a fuel canopy for seven gas pumps. The site is on 1.8 acres. The P&Z Commission will consider recommending a development review permit. The store would be the third Circle K in Maricopa. Monday’s agenda includes a public hearing for Global Water’s request to rezone its property on Powers Parkway from C1-2 Industrial to General Industrial. The company is also asking for a development review permit for its facility expansion. The planned Anderson Russell subdivision will have a public hearing on its request to rezone as a Planned Area Development. The property is 776 acres on the far southeast end of Maricopa just south of Maricopa-Casa Grande Highway. P&Z meets Sept. 11 at 6 p.m. in council chambers at City Hall. 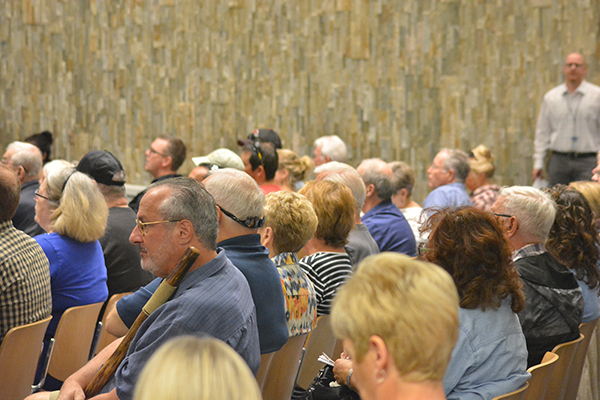 Maricopa City Council will hold a public hearing in August on the rezoning request for a parcel of land to allow a local water utility to expand. In the past month, Global Water has received permits for a 1,200-foot wall and for grading and draining as part of the expansion project. 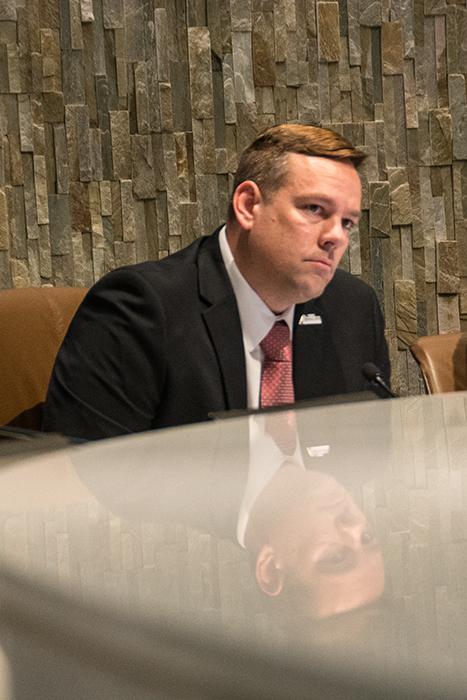 During the planned regular session of the council’s meeting on Aug. 1, there will be a public hearing and a subsequent vote on the approval of a zoning variance to allow for Global Water to expand its water reclamation operations, according to City Manager Gregory Rose’s weekly report. Global Water General Manager Jon Corwin said the expansion is in response to Maricopa’s projected residential and commercial growth. Global Water currently serves around 18,500 homes and businesses. The expansion will allow for the plant to process 60 percent more wastewater, he said. That’s another 11,000 possible connections. Corwin said it’s important to be able to handle the anticipated influx of wastewater. But, he said, it’s about continuing to be good stewards of such a precious resource. “We treat the sewage and then turn it into Class A Plus recycled water and send that back out into the community to reduce the amount of water we have to pump out of the ground,” Corwin said. The reclamation program feeds their “purple pipe” or recycled water redistribution program which helps keep the grass green and the small local lakes full. The non-potable water system is safe for irrigation and feeding water features like ponds and fountains, but is unfit for human consumption. The expansion will occur at Global Water’s main processing facility located to the northeast of Rancho El Dorado. A local utility company has issued a formal public response to a swath of customer complaints recently lodged against them for their high rates, alleged dubious billing practices and poor-quality customer service. 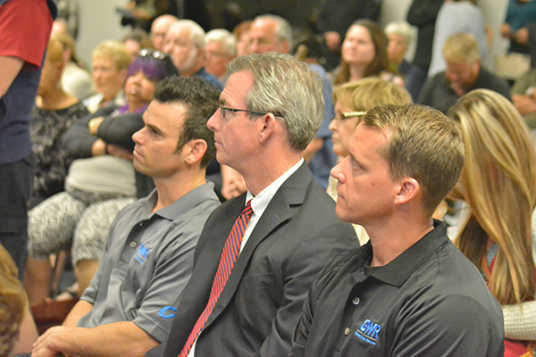 Global Water Inc. responded to their customer’s concerns with a letter and presentation to the Maricopa City Council during their work session June 6. The company announced several changes to its fee structure and customer service. Their rates, however, are not likely to shrink any time soon. The utility has in the past cited a problematic infrastructure they inherited back in 2004 as well as infrastructure development done in anticipation of future growth as reasons why their rates are higher than average. Councilmember Nancy Smith expressed concern with this explanation and wanted to know when there might be a turning point where Global Water customers won’t have to pay exorbitant rates because the city has grown to a level were the utility’s revenue offsets the cost of their development investment. Global Water President Ron Fleming highlighted the aforementioned reasons and further described the rate structure, approved by the Arizona Corporation Commission, which he said allows for Global Water the right to make a yearly rate-of-return of at least 7.5 percent, a figure he has not yet seen his company come close to. 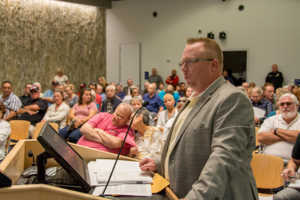 Their new policy also acknowledges the extenuating circumstances that can arise from “health concerns impacting a customer’s ability to pay,” Fleming said, which will be evaluated by local staff to help assist with billing and financial concerns. As for customer service, Fleming said his company has added specially-trained Global Water staff, which has produced between 92 and 95 percent customer satisfaction since December. A point of pride for Global water is evident in the fact that, according to them, customers in their Santa Cruz water district use the least amount of water among some of their competitors — 70,000 gallons less per year per customer. This, Fleming said, is a result of the use of purple-pipe water recycling alongside the overall stewardship of a finite resource. Another reason for rates not shrinking in the future, Fleming added, is the state of Arizona will not likely see a sudden influx of accessible water. In fact, the amount of accessible water is likely to decrease in the future due to population growth, weather patterns and diminishing ground water supply. 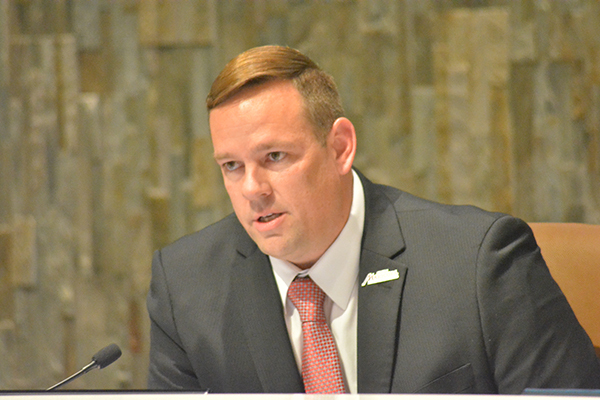 “Like it or not, Pinal County is going to be ground zero for this reality,” Fleming said. 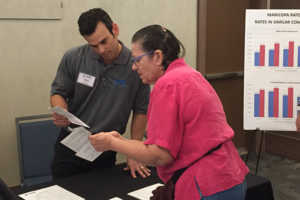 In the first of what is expected to be monthly customer forums, representatives from Global Water Resources took questions and complaints from the public Thursday. Topics ranged from high rates to lack of notification when meters were being changed out. The forum was the result of a public hearing called by the City of Maricopa in February with an angry audience of customers in the wake of water main breaks last fall. 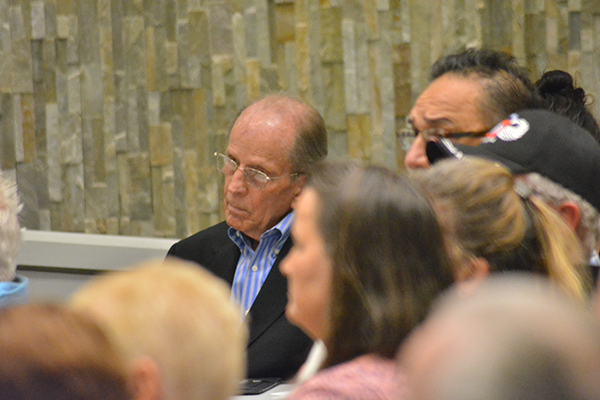 At Thursday’s forum at Elements Event Center, the room was divided into areas to funnel specific questions to the appropriate administrator. CEO Ron Fleming had a regular scrum of people around him. He thought he would get many more questions about rates and cost of service but surmised they had been directed to other tables. “People mentioned their bills have gone up and struggled with finding out why,” he said. “If they wanted input as to the rates and stuff, I would tell them I’d really like to see it perhaps done on a per-gallon basis as opposed to the flat rate that everybody pays whether you use water or not,” said Barry Trush. He and his wife Janice live in Maricopa only about six months out of the year but have a $100 monthly bill year-round in Glennwilde. Resident Susan Cameron said her bill has been regular for eight years, but she attended to be a watchdog for friends who have seen an unexplained jump in usage on their bills. Debbie Richards asks CFO Mike Liebman about the rebate program. 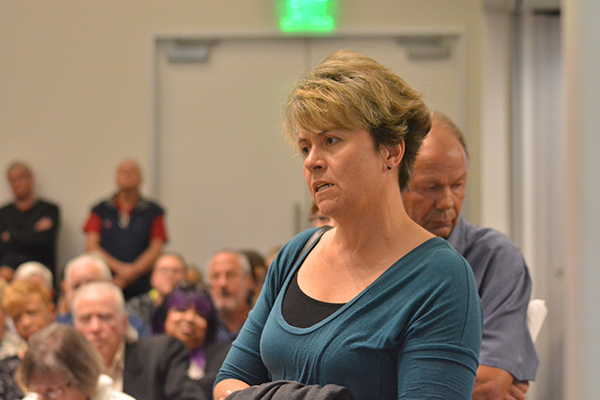 Maricopa Meadows resident Debbie Richards came with questions about the rebate program. In this case, however, Richards said she received an explanation about the rebate. But there were concerns voiced that required later follow-up. That included the responsibility of cleaning and weeding the Santa Rosa Wash falling on the residents of Rancho El Dorado, the position of Global Water being a privately-owned company answerable to investors, and the door-hangers being used (or not) as notifications. Global Water is in the process of changing 18,000 meters. The plan was to have each home notified with a door-hanger stating the day and approximate time the water would be turned off. Fleming said it is apparent workers are not always hanging the door-hangers correctly. Global Water’s own data showed the dramatic dip in customer service in November, when main breaks occurred. Fleming said the call center always receives a lot of customer calls from Maricopa “for some reason,” typically 10,000 to 12,000 a month. But in November, that jumped to 16,334. At the same time the level of service for those phoning in dropped to 55 percent, the company’s lowest of the year. More than 1,500 customers hung up after waiting more than two minutes for a representative. The average wait time was nearly seven minutes. The service stats rebounded in December but began to slide again in January and February. Fleming said the turnout for the forum was “decent” compared to the large crowd he was expecting. He said the next forum might not be in an open house format but might be a presentation at the Global Water office. 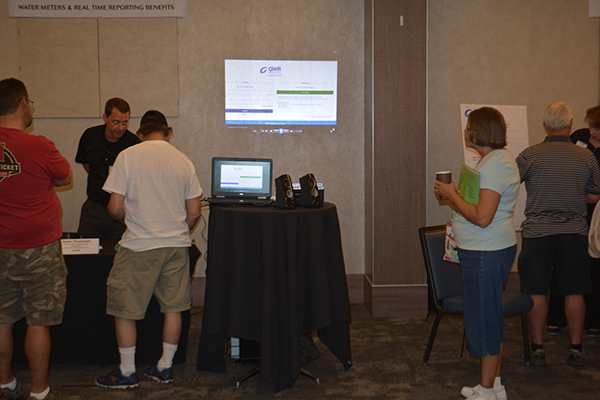 The company is also starting a new website specifically for its Maricopa customers. March 2017 – Global Water hosts customer forum. February 2017 – City of Maricopa hosts meeting to air public complaints about Global Water. January 2017 – Global Water begins upgrading meters. January 2017 – Water main breaks in Province. November 2016 – Water main breaks on Porter Road. November 2016 – Water main breaks on Honeycutt Road. November 2016 – Global Water negotiates with Maricopa Fire & Medical over removal and prevention of sediment buildup at hydrants. April 2015 – Residents of Senita, Rancho El Dorado, The Villages at Rancho El Dorado and Province complain about fees to clean up 404 Wash.
January 2015 – New Global Water rates go into effect, raising monthly water bills 4.4 percent to begin an eight-year, annual series of rate increases as approved by Arizona Corporation Commission and agreed to by City of Maricopa, Residential Utility Consumer Office and 14 HOAs. April 2014 – Water main breaks on Honeycutt Road. August 2013 – Settlement agreement filed with Arizona Corporation Commission increases wastewater bills 10.5 percent and water bills 42.5 percent; rate increases will go into effect in 2015, and Global Water is prohibited from requesting another rate increase until May 2017. 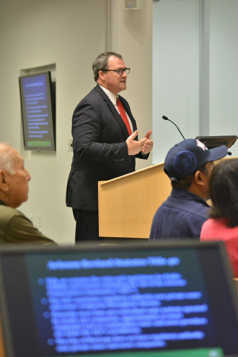 May 2013 – Public hearing on proposed Global Water rate increases. February 2013 – City of Maricopa applies with Arizona Corporation Commission to intervene in rate case. 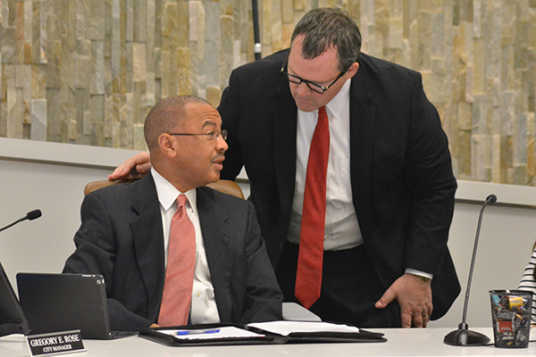 January 2013 – City forms task force to respond to rate-increase proposal. July 2012 – Global Water says it is getting no rate of return in Maricopa as determined by the Arizona Corporation Commission and is seeking a rate increase. June 2011 – Maricopa City Council adopts Resolution No. 11-40 to support use of Infrastructure Coordination and Finance Agreements as a means for financing water, wastewater and recycled water infrastructure. August 2010 – Arizona Corporation Commission approves rate increase that will take average residential water/sewer bill from $76 to $96 by 2012. December 2009 – Global Water pledges to spend $150,000 each year for five years to implement water-conservation practices for its larger water users. December 2009 – Arizona Corporation Commission holds hearing in Maricopa as part of three weeks of hearings over proposed increase in Global Water rates. November 2009 – Global Water seeks 34 percent gross revenue increase from Santa Cruz system and 130 percent gross revenue increase from Palo Verde wastewater system. August 2007 – Global Water shuts down Smith Well over water quality. January 2006 – MOU goes into effect. Global Water will pay $50 per residence fee for connections in city limits and $100 per residence fee outside city limits. 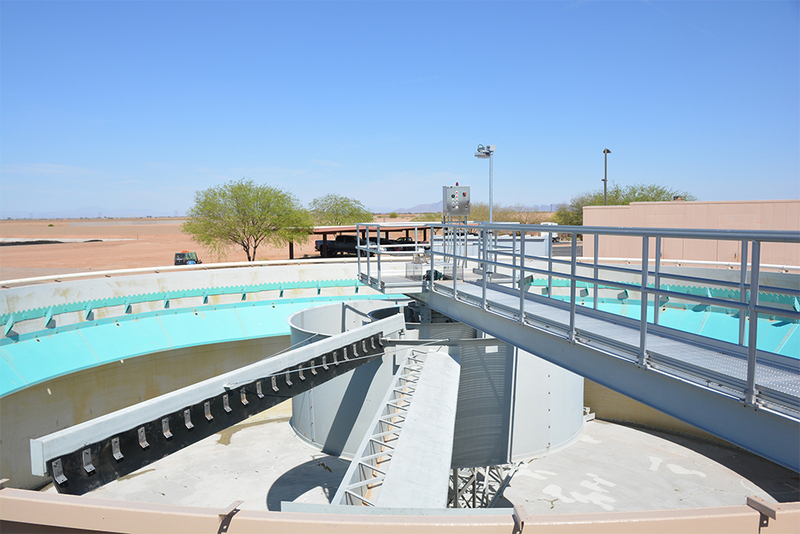 December 2005 – Global Water and City of Maricopa enter public-private partnership for water and wastewater services in Maricopa and outlying areas. June 2005 – Global Water agrees to purchase 387 Domestic Water Improvement District from Sonoran Utility Services, serving HOAs south of the railroad tracks. 2004 – Global Water purchases Santa Cruz Water Company and Palo Verde Utilities Company, acquiring 175 square miles of service area. 2003 – Global Water Resources forms. 2001 – Palo Verde Utilities Company and Santa Cruz Water Company merge into one limited liability company. 1998 – Palo Verde Utilities Company files for Certificate of Convenience & Necessity from Arizona Corporation Commission to provide sewer service. 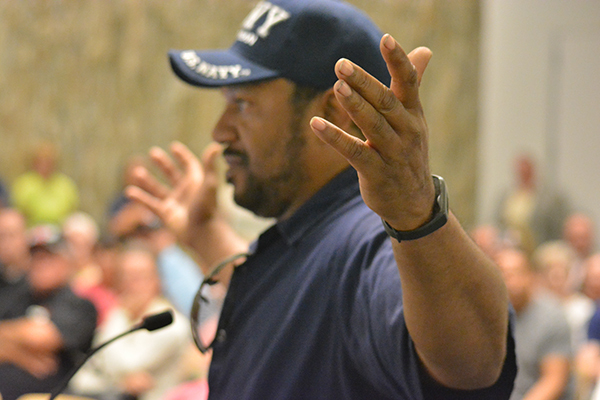 Angry Global Water customers packed City Hall for a special meeting Tuesday evening. 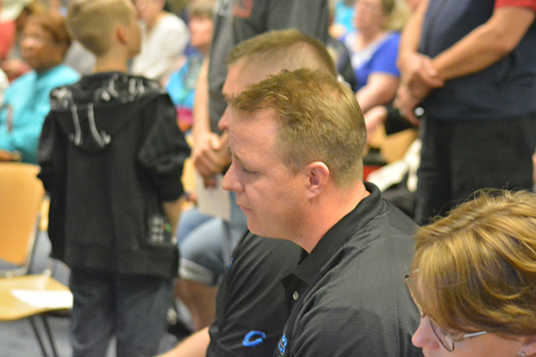 The mayor and city council lent their ears to the public Tuesday, calling on residents to speak about the city’s privately held water utility, Global Water. In a packed City Hall chamber, roughly 20 people lined up to voice their concerns regarding water quality, main ruptures and alleged poor quality customer service. The most heated accusations of the evening, however, were directed toward what customers called “dubious” billing. Allegations lobbed cited instances in which late fees were charged to customers that never received an initial bill, or when customers were charged for replacing meters they didn’t break. These and other allegations have mounted over the years and have caused some residents to seek remedy. Though McDonald did publicly recognized the large role Global Water played in helping the city grow, he also suggested that at some point the company lost its way. 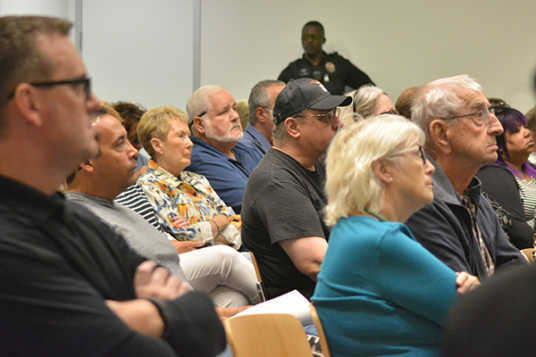 Though Mayor Christian Price announced at the outset the meeting would not be addressing rates, those in attendance and following the meeting online continued to complain about the expensive basic fees. Global Water’s rates and annual increases were negotiated with the City and most of the homeowner’s associations as part of a rate case before the Arizona Corporation Commission in 2014. 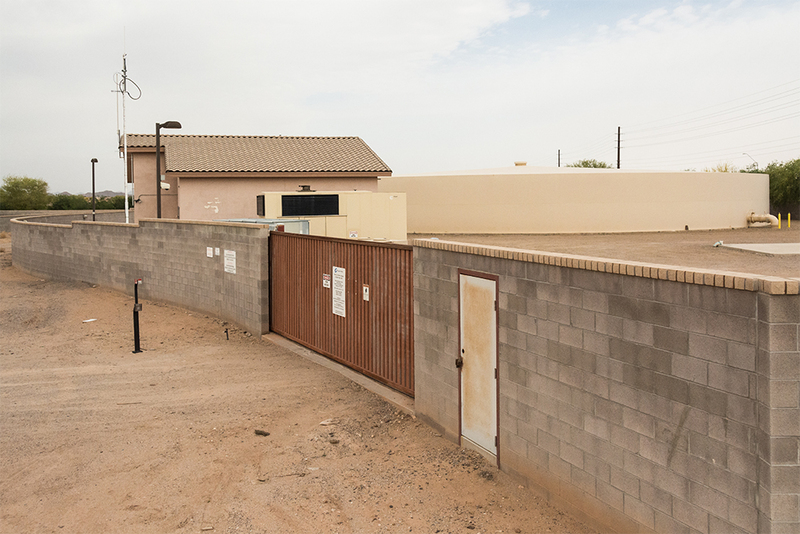 Multiple Global Water customers in Maricopa have received bills exponentially higher than their typical bills — $1,800 in one case — hence the extensive public outcry. According to multiple residents’ complaints, they were told by Global Water’s customer service representatives in a call center the problem must be on the customer’s side of the meter and that if technicians had to do an inspection and nothing was found to be wrong, the customer would be charged $30. In response to the accusations, Global Water CEO Ron Fleming said the company has been working for the past six months with the billing service provider and their customer service department to solve some of the billing issues. However, he equated the fees for meter replacement and basic service to standard practice and infrastructure operational costs. All accusations and unsatisfactory customer service aside, no proof of fraud was presented at the forum, only a handful of errors — seven — that Global Water has owned up to. Fleming said the company plans to start having regular public forums at the Global Water building in Maricopa for customers to air grievances and complaints and get answers. Global Water is the only water provider for the majority of residents in Maricopa. Without evidence of deliberate fraud, customers have little line for recourse. The city council’s regular agenda for the night also included two executive sessions that sought legal advice regarding Global Water. 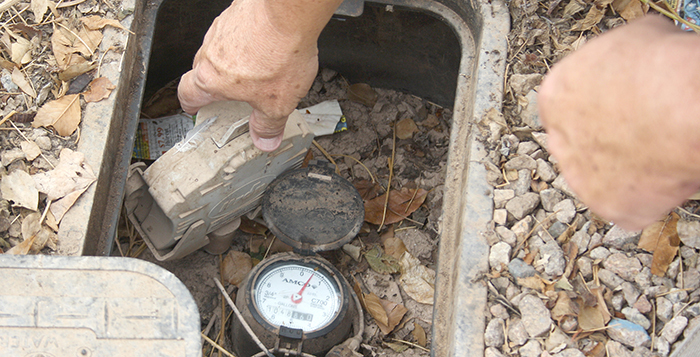 One of Maricopa’s water utilities is beginning a meter exchange program for its customers starting the week of Jan. 23. Global Water will be replacing old and worn out water meters across the city in an effort to not only update the system but also to provide a more user-friendly interface. 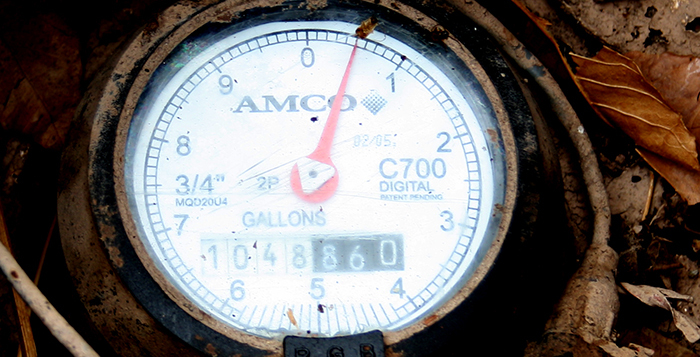 The new meters are a hybrid mechanical meter like the 12- or 13-year-old existing meters. However, the new meters will feature a more precise digital readout. As is true with the existing system, customers will be able to track their water usage online with the new system, giving them the ability to personally monitor their consumption down to the hour. Global Water General Manager Jon Corwin said in addition to the upgraded meters, the utility will be launching a proactive alert system through which customers will be able to sign up for text message or email alerts that notify them when they are approaching or exceeding their average consumption. By notifying customers when a certain amount of water has been metered, the new system will help them quickly locate and repair costly leaks they otherwise may not notice until they received their bill. Global Water will begin mailing notifications to customers starting this week to provide details of the project. During the replacement process, customers will be without water for about an hour. Door-hanger notifications will also go out a few days prior to replacement to allow for rescheduling if needed. Meter replacements are scheduled to wrap up by the end of April, Corwin said, and the new proactive alert system will likely be launched in late June or July. For the third time in as many months one of the main lines maintained by local utility Global Water ruptured Tuesday morning. The water main located near Province Parkway in the Province neighborhood of Maricopa ruptured around 7:30 a.m. leaving customers temporarily with diminished or no water pressure. Client Services supervisor Beth Huerta said the main break on Tuesday affected Province homes for about an hour, but the issue was quickly resolved. Global Water General Manager Jon Corwin said the cause of the rupture is unknown at this point and crews are still working to determine the culprit. Past water main ruptures have been attributed to a number of factors including the geological shifting of earth around the pipes and substandard construction. Global Water inherited the infrastructure when they acquired their predecessor companies in 2011. However most of the system was installed shortly after the city was incorporated in 2003, meaning most of the pipes are likely 12 or more years old. A local water utility official announced a recent cost-saving endeavor at the city council meeting Tuesday, an effort that could mean a deceleration of future rate increases for consumers. Global Water General Manager Jon Corwin spoke about a recent contract renegotiation with its call center service provider, Fathom, which will save the utility company money. Corwin stated the new service agreement extends the length of the call center’s contract while reducing in-house costs to Global Water, changes he believes will contribute to less dramatic rate increases in the future. “We think that’s a big win for us and ultimately for the customers in Maricopa,” Corwin said. Rate increases are determined by a set schedule negotiated years in advance through the Arizona Corporation Commission, an organization that monitors investor-owned utilities, thus any changes will not have any immediate effect on currently planned rate hikes. The agreement of yearly increases applies to eight years and went into effect in 2014. 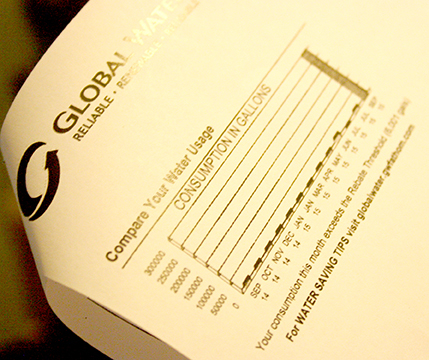 Though it’s unclear exactly when the next rate case will be or how much future rate increases will be slowed by the recent savings, it’s unlikely that without a test year planned for the near future Global Water will be presenting a request for rate increases prior to 2021 — the end of the current rate-increase schedule. 2021: Increase of $3.07, to 634.18. 2021: Increase of $6.62, to $69.53. Local water supplier Global Water suggested on Thursday residents living in the vicinity of recent water main ruptures should flush faucets to clean silt dislodged by pressure changes. Following three separate incidents where main water supply lines broke on Honeycutt Road, Porter Road and in the Maricopa Meadows subdivision, Global Water customers have reported murky or “dirty water” coming from their faucets. Rather than silt or sand entering the supply lines at the point of failure, Global Water General Manager Jon Corwin said it’s more likely the murky water is due to sediment already present in the lines that was dislodged by pressure changes. Global Water says there is no danger in consuming the murky tap water, and by simply opening faucets and allowing them to run clean customers can expel most of the accumulated sediment. In other areas Global Water customers may also experience white, cloudy water, which is not attributed to sediment, but is instead due to excessive air in the lines, an issue that can also in part be remedied by flushing taps. Though the exact cause of the ruptures has yet to be determined, Corwin said the incidents were likely unrelated. Possible causes include sub-standard construction and/or materials, as well as geological variations in the ground around the pipes. The exact age of the pipes is unknown. However, Corwin believes most of the lines they inherited from their predecessor, the 387 District, were installed 12 to 15 years ago. Global Water encourages customers to notify them if these issues persist or if they have any other questions or concerns about their water. 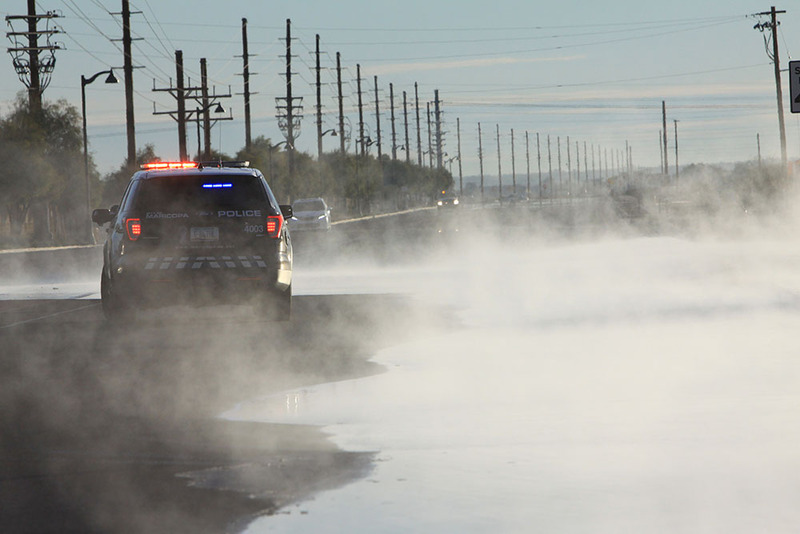 For the second time in eight days, a water line burst on a major roadway in Maricopa. Tuesday night, a 16-inch main broke on Porter Road between Honeycutt Road and DR Horton Drive, which is an entrance to Homestead. 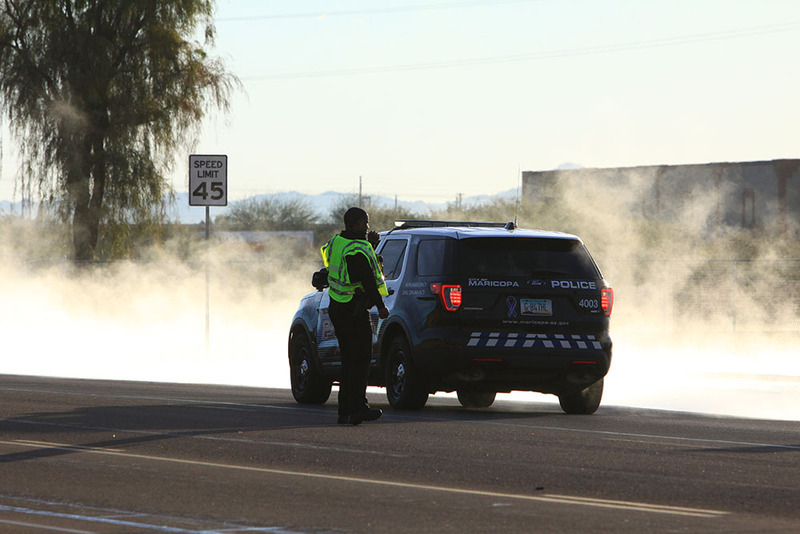 As Global Water isolated the problem, Maricopa Police Department detoured traffic around the area for several hours. The cause of the breakage is not known. The break spilled water onto a short section of Porter Road. Beth Huerta, client services supervisor, said Global Water is drying out the area of the break before trying to determine the origin. She said the company is working with Electrical District No. 3 to be sure no lines will be in the way as they make repairs. 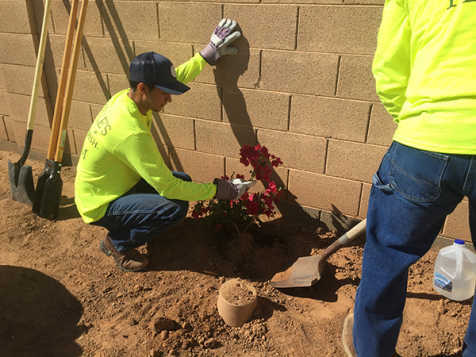 Because Maricopa’s water utility is on a loop, many Global Water customers experienced at least a decrease in water pressure as workers contained the problem. The incident comes eight days after the rupture of another 16-inch main on Honeycutt west of Butterfield Elementary School. That breach Nov. 14 caused a shutdown in service to businesses in the Maricopa Business Center for two days. That was exacerbated by a damaged hydrant in The Villages that had not been previously reported. 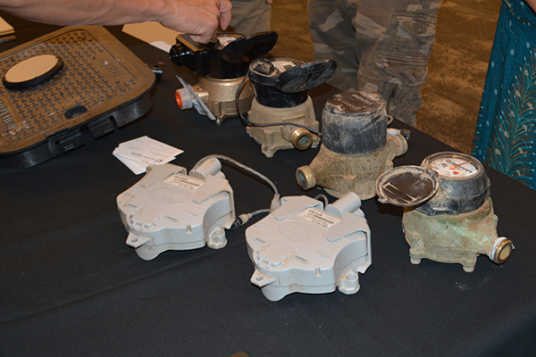 Municipal water supplier Global Water is in negotiations with City of Maricopa Fire & Medical over an agreement to clean and maintain hydrants within the city, a move aimed to help mitigate risks of equipment rendered inoperable by dirty water. 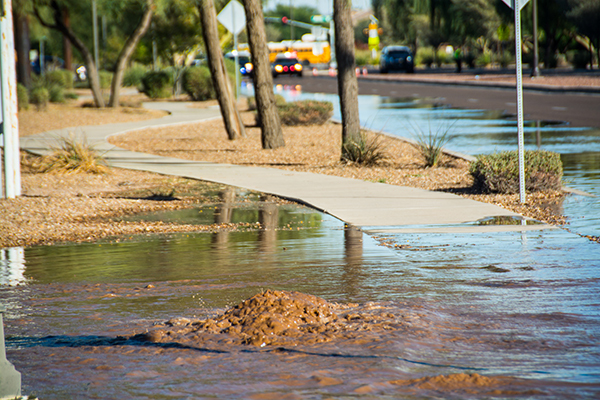 The private company, which controls and distributes most of Maricopa’s fresh water supply, is working closely with the fire department to reach an agreement about the removal and prevention of potentially dangerous silt and sediment buildup in the city’s hydrant supply lines. In the past, sediment from hydrants has been identified as a source of problems with MFD’s crucial pumping equipment. 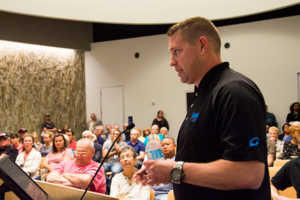 During a call to the public at the regular session of the Maricopa city council meeting Nov. 1, Global Water General Manager Jon Corwin outlined the measures the company is taking to correct the problem, and how after working together over the past year the two parties have likely reached an agreement. In an earlier interview, Corwin said he was never made aware of any recent issues with MFD pumping equipment and that if it had happened it must have happened in the distant past. Maricopa Fire Chief Brady Leffler, on the other hand, insisted that the incident did happen around a year ago, and that it was reported. Nonetheless, Leffler went on to say that, despite an initial sluggish response from the company, he is happy that Global Water has begun working closer with MFD to address the issue and the two parties were soon to reach a workable agreement. 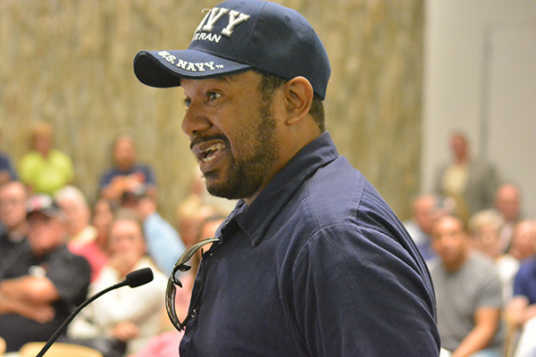 Corwin agreed the meeting was constructive and Global Water has tentatively agreed to continually and systematically flush hydrant lines to prevent any issue in the future. The proposed agreement would also allow the fire department to go in after the flushing is done to check the hydrants’ functionality as well as assure that non-working hydrants are addressed and reconciled with the Geographical Information Systems public safety standards. Brielle Macedo was diagnosed with I-cell disease when she was 18 months old. There is no cure for the disorder formally known as Mucolipidosis II. The average life span for those with the recessive disease is three to five years. Brielle is 3 years old. 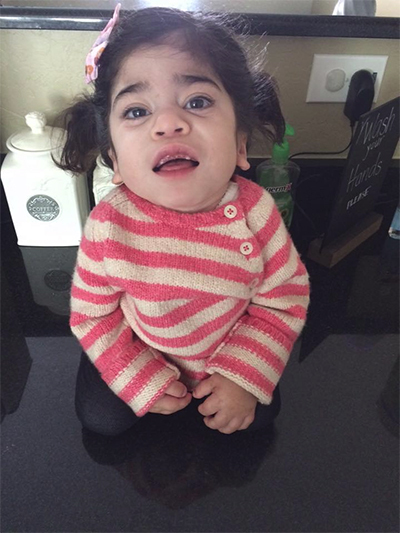 Her mother Kim describes the rare disorder as attacking every cell in her body. It has also caused some symptoms of dwarfism. She is small for her age, easily tires and is far more likely to crawl than walk. She also cannot mix in large crowds, which keeps her mainly indoors and almost always at home. She wished for a playspace instead of the strictly desert backyard of Kim and Javier Macedo’s Sorrento home. The Macedos originally just asked for a “track” where they and Brielle’s two sisters can walk her in her wheelchair. The Make-A-Wish Foundation started looking for ways to make that happen, but it was even a little more challenging than expected. One of the problems was that Make-A-Wish has only two volunteers in Maricopa, so making the connections for such an undertaking was difficult. The project took four months to get off the ground but was mostly completed on Saturday. 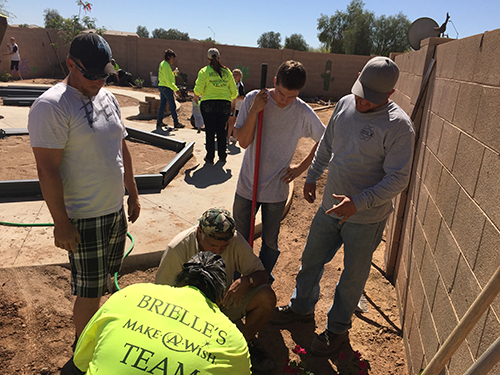 Riecks owns AZ-Ry’s Landscaping in Maricopa. Joining the cause from the business community was ACE Hardware, Electrical District No. 3, Wildcats Building Materials, Leaf & Feather Farm, Horizona Distributors and Papa John’s Pizza. From Phoenix, Suntec Concrete and Hardison Downey also provided their services. “She’s been confined to the house, so we’re going to bring the living room outside,” Rosvall said. 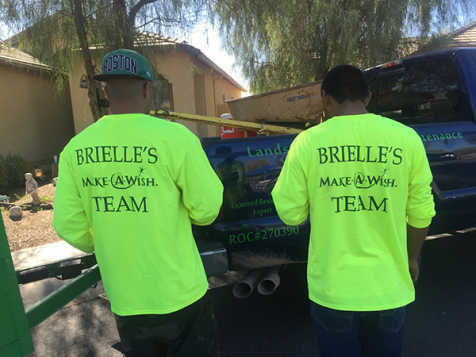 Huerta said Global Water, which had its CEO and general manager both working in the Macedo yard, first heard about Brielle from the Maricopa Economic Development Alliance. 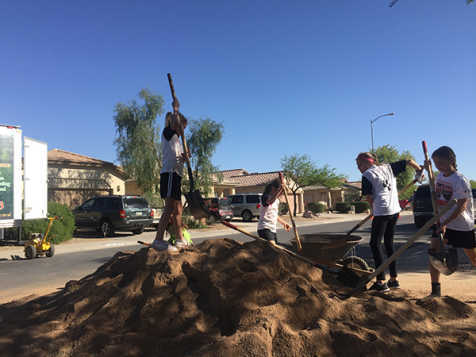 The Professional Firefighters of Maricopa Local 4561 also participated, as did the soccer team of which 10-year-old Ashley Macedo is a member. Ashley and middle sister Bella did their share of work to make Brielle’s wish come true. The completely reworked backyard has a cement track with a seating area, turf, plants and a gazebo. “She’s just going to love it so much,” Kim Macedo said. One corner is designated as a memorial garden, a reminder that this is not the first heart-wrenching adversity faced by the Macedo family. Kim and Javier’s second child, Jaileen, was born with a different recessive disease and lived only two days. Javier Macedo said he was amazed at the volunteers who showed up to help Saturday. Of the dozens working, he said he knew only seven or eight. He said he and Kim have been able to stay strong through Brielle’s ordeal by maintaining perspective. It was something they had to learn how to do, Kim Macedo said. She left her full-time job to stay at home with the girls. Javier works as an analyst at University of Phoenix. Going down to one paycheck was a different kind of challenge, but they have found help. A nurse comes in nightly to watch Brielle’s medical needs, and a day nurse comes when the family takes the other kids to soccer and other activities, alleviating some of the stress of the situation. 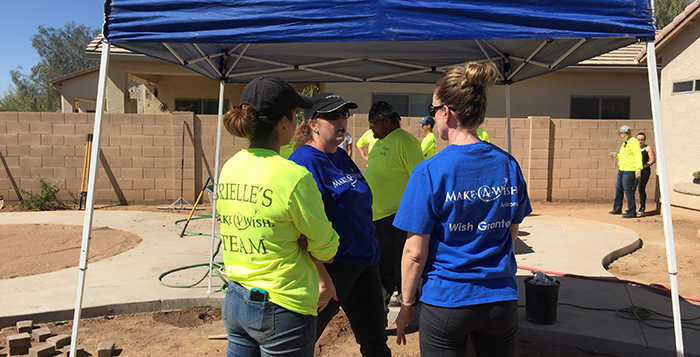 The outpouring of support from the community indicated for Make-A-Wish the potential of Maricopa to fulfill the foundation’s needs in the city. 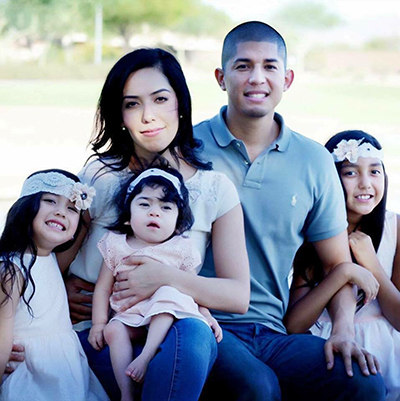 Water bills in Maricopa can cause powerful reactions, but the August bill for a Senita couple actually brought on an asthma attack. Walter Mrozowski and Corrine Tabarez were charged $1,930.39. Mrozowski called it “a shocker.” It literally took Tabarez’s breath away. Their previous bill was $132.70. The bill indicated the couple used 305,022 gallons in one month. That is six times the size of an average residential swimming pool. Mrozowski and Tabarez have not installed a swimming pool, nor have they planted an orchard. Their meter reading at the end of July was 1,038,119. The meter reading shown on the bill for Sept. 1 was 1,343,141. The actual number on the meter on Sept. 21 was 1,048,860. The 300,000-gallon over-read is an anomaly, as far as Global Water General Manger Jon Corwin is concerned. Because their bill arrived on a weekend, the couple did not know how to reach anyone at Global Water. The stress brought on her asthma. Tabarez reached a staff member the following Monday, Sept. 14. “She said they would not charge me to send someone out to read the meter since they were not getting daily readings from the meter,” Tabarez said. 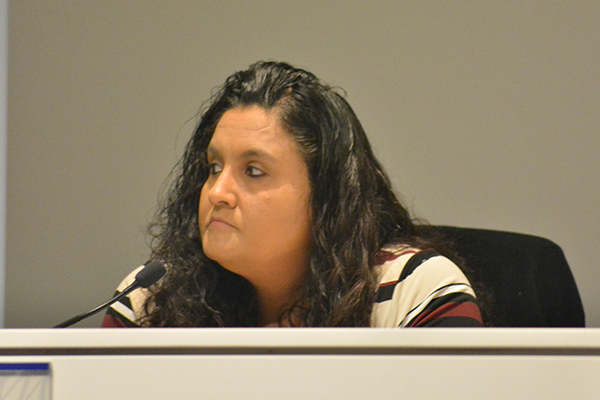 At 2:30 p.m. Sept. 18, Tabarez received a call from a Client Services representative, who apologized and told her they would be getting a new bill. Tabarez said she was told Global Water sent a technician to read the meter because the transmitter was broken. When Tabarez said it did not appear anyone had read the meter in a while because it was caked with mud, she was told that happens after a rain. But Mrozowski said modern technology should have prevented such an error and at least have indicated a problem with the meter. Customers who get an anomalous reading can call Global Water and have a technician sent out for a physical re-read, Corwin said. “We see a lot of instances where high consumption is driven by a leak in the irrigation system, a water softener that gets stuck backwashing or toilets that continuously run,” he said. A mis-read, rather than a leak, is the suspect in the Mrozowski case. Corwin said the claim that many meters are broken is inaccurate. And Global Water tries to keep estimates at a minimum. Mrozowski called the experience a wake-up call. He said he wonders how many other Maricopans are affected without knowing their meter readings could be inaccurate. He would also like the company to be more proactive in detecting serious anomalies, like 300,000 gallons of water. The project to extend Edison Road from Firehouse 575 to State Route 238 is still moving forward, but at half the size. 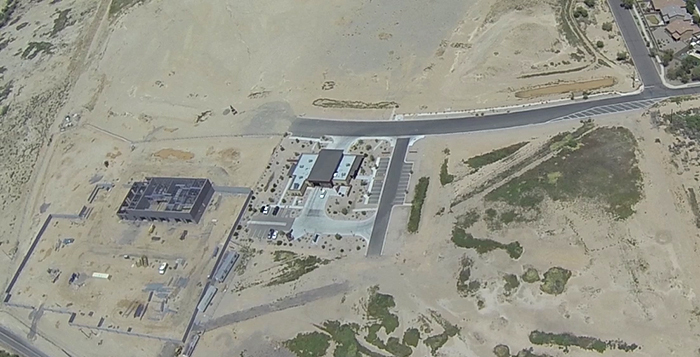 The original plan was for Edison Road to feature four lanes accessing the future Estrella Gin Business Park while providing an alternative connection between SR 238 and SR 347. The initial $3 million estimate was set by a program, and Fay said current officials are unsure where the number originated. However, due to a the change in cost estimates and stalled negotiations among the city, Global Water and neighboring landowners, the project will move forward as a two-lane road. 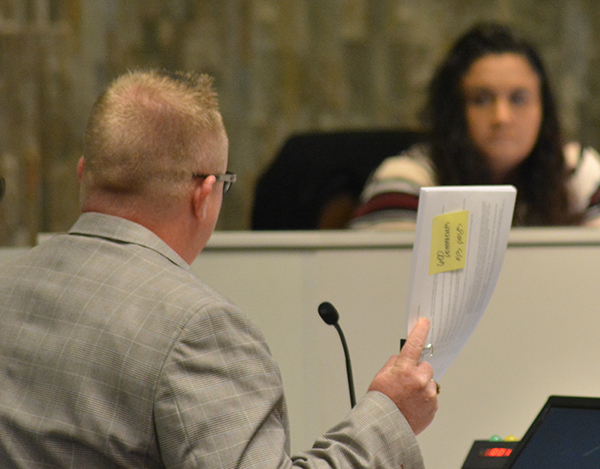 If the city moved forward with its plan to build a four-lane road, there is a high likelihood it would have to tear up the road later to insert the utility lines, he said. According to Mayor Christian Price, the construction companies aren’t the only issue when it comes to negotiations. Both Global Water and landowners will have a say in the project details as well. 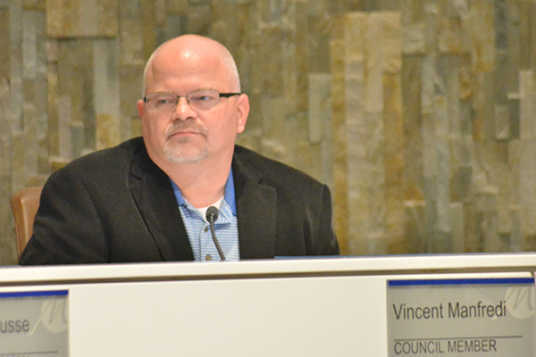 Jason Thuneman, director of the project management office for Global Water, said the city is responsible for constructing on-site water and wastewater utility lines. Lines under a four-lane road to SR 238 would have to extend the full length of the roadway, he said. “ If the City decides to proceed with only a two-lane roadway at this time, water and wastewater line extensions can be completed in the future at the same time the additional lanes are installed since the infrastructure under this roadway is not necessary until the property north of Estrella Gin is ready to develop and requires service,” Thuneman said. The city bought the Estrella Gin property for $3.2 million in 2011 and paid almost $48,000 for a feasibility study for a business park. The new fire station is already on the property, a Public Works building is being constructed, and the Amtrak station will be moved to the site. “Global’s role with respect to Estrella Gin was to extend water and wastewater to the property line, which was completed in 2011, prior to construction of the Estrella Gin Fire Station,” Thuneman said. Last year, the city received a $250,000 Rural Economic Development Grant from the Arizona Commerce Authority to help extend Edison and access future businesses and facilities. There are 40 acres available for business development. The change in the extension for Edison Road creates potential problems for the development of business in the area. The Estrella Gin Business Park has already seen significant delays. Cockle, who has lived in Maricopa for the last seven years, was expecting to be in his new business location by January 2014. 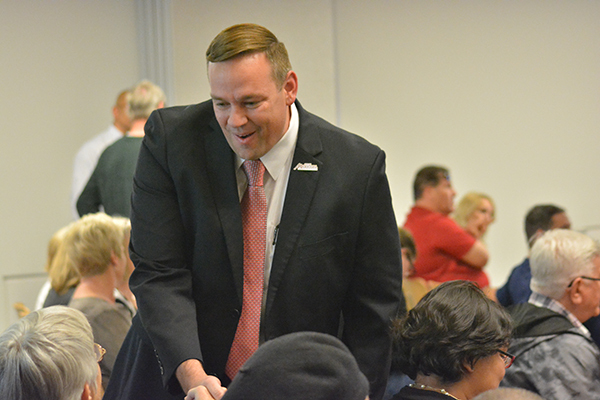 His hope is to provide jobs to Maricopa residents and boost the local economy, but his inability to get into a permanent location is making that goal hard to achieve. The delays have forced Cockle to consider moving his business to accommodating cities. Cockle feels developing businesses are unable to make proper plans in Maricopa due to lack of adequate business-ready space. Maricopa has plenty of space for potential development, but few business parks are “move-in ready.” Projects such as the Edison Road extension will help address the issue, but the project’s unknown completion date doesn’t address the immediate need, he said. The city’s need is access to the property. Until utility lines reach SR 238, it is fiscally irresponsible to build four lanes in case they need to be torn up to place the lines, Price said. Electrical District No. 3 is prepping a 12,000-volt line extension on Edison Road to SR 238. ED3 Director of Engineering and Operations Larry Yates said a preliminary design has been submitted to the city for review. ED3 completed the new service extension to the fire station and has a construction agreement for the Public Works building. The utility is also working on a power line conflict review for the relocation of the Amtrak station to the Estrella Gin site. “One advantage the city has that should have a positive marketing impact for the Estrella Business Park is there are 12,000-volt three-phase primary lines installed around the perimeter of the property, with the power line extension that is being designed for the Edison Road Project, which should add significant value to the property as it could lower the cost for electric service,” Yates said. Last year, the city received a $250,000 Rural Economic Development Grant from the Arizona Commerce Authority to help extend Edison and access future businesses and facilities. There are 40 acres available for business development, but that development has stalled with the road extension. Despite the monetary setback, Fay is confident the extension will be completed. For that to happen, the project design had to change. The project is moving forward but starting small. By cutting two lanes off the initial design, the city is able to save money on the project as well, though the cost may still be higher than original estimates. According to Rose, the only project the city is planning to allocate funds from to help pay for the road is a “right-of-way improvement bill” for City Hall. The extra money should allow the city to move forward with the Edison project. Negotiations will continue with Global Water and landowners to make the four-lane expansion happen, but even if the “ideal” expansion is delayed, the city intends to complete it. It’s unclear at this time where the city will find more budget cuts if needed for the project. However, Fay and his team will be looking into all of their options at each stage of the design.